Hard-pressed English soldiers swore they had seen angels, ghostly archers—or even St. George himself—riding to their aid near Mons in World War I. Some Tommies swore it had been St. George, the warrior saint of England. Others said it might have been St. Michael, since he carried a gleaming sword. A few said they couldn’t tell, but it had definitely been an angel, maybe more than one. Some men were sure they had seen three wonderful, tall figures towering above the smoke and dust of the battlefield. For others it had been a brilliant light, a golden aura against a brilliant sky, or a cloud in which indistinct but heroic figures had come and gone, aided by phantom archers from the olden days of the English warrior-kings. Whatever it was, the soldiers agreed, it had saved their lives. No amount of civilian scoffing would ever change that. Skeptics back in England and America did scoff, but that was to be expected. Well-meaning clergymen and physicians made wise and condescending remarks about hysteria, battle fatigue, and fear. Others shook their heads knowingly and tut-tutted about superstition and overactive imaginations. Perhaps that was what had caused these “visions,” as the newspapers called them. But the naysayers and doubters hadn’t been there. They hadn’t fought against enormous odds, with comrades dying next to them, baked by a remorseless sun and drenched with rain. And they hadn’t walked the dreadful road west from Mons. It was 1914, and Europe flamed and thundered with the red ruin of war. The roads of France and Belgium swarmed with endless columns of dusty infantry, miles of horse-drawn guns and wagons, and miserable hordes of Belgian civilians trying to move what remained of their lives in carts. Over the miles, from the Swiss frontier to the Belgian fortress of Liege, the armies clashed and the casualties mounted. In those terrible days of August heat, the powerful German right wing swung like a great fist west and southwest from the Belgian frontier and struck deep into France. While the French threw away much of the flower of their army in head-on assaults against the German forces, the great right hook of the German offensive struck the Allied left, falling on a segment of the French army and the small but doughty British Expeditionary Force. The BEF comprised much of Britain’s tiny regular army, a minuscule force of four infantry divisions and five cavalry brigades when compared to the multitude of German army corps advancing on Paris. The BEF moved east toward the advancing Germans, marching across storied ground past Malplaquet, where Marlborough had whipped the French two centuries before. Up ahead was the field called Waterloo. Nobody was quite sure where the Germans’ main stroke would fall. The first heavy fighting swirled around the Belgian city of Mons, a dreary industrial area studded with gray villages, dismal slag heaps, and shabby factory buildings. There, on Sunday, August 23, Sir Horace Smith-Dorrien’s II Corps took on the German juggernaut along the Conde Canal. The slimy, stinking 60-foot waterway was not much of an obstacle, but it would slow down the Germans and make them optimum targets. Smith-Dorrien’s two divisions, stretched thin over 21 miles, found themselves attacked by two German corps, with another closely approaching and still another on the way. Although the British were badly outnumbered, their massed fire stopped the Germans cold. In the morning, its right flank now uncovered by the French retreat, the BEF retreated, tramping down the long, hot road toward the west. Back they went in the heat and dust, occasionally turning to bloody the German corps pursuing them. Again and again the BEF’s murderous musketry reached through the shimmering heat of the French fields to drop graycoated German infantry in heaps hundreds of yards away. But there were simply too many enemy infantrymen and too much artillery. The BEF fell back from Mons step by grudging step, leaving behind them more graves, more old friends buried far from England. The worst of the fighting was around Le Cateau, fought on the anniversary of Edward III’s great victory over the French at Crecy. It was not a place the II Corps commander would have chosen to fight, but Smith-Dorrien wisely elected to make a stand rather than try to disengage and withdraw in the face of overwhelming numbers. His men were tired, time was short, and the roads were clogged with transport columns and hordes of refugees. The odds were 4-to-1 against the BEF in infantry, plus the usual German superiority in guns. All through the morning of August 26 and into the afternoon, Smith-Dorrien’s troops held up the German steamroller with their deadly riflefire. With the enemy lapping about his flanks, Smith-Dorrien passed the order for a fighting withdrawal. That night the BEF fell back in darkness and driving rain. Many of the men had reached the end of their endurance; some had not eaten in 24 hours. Still they slogged on. A British division commander, tears in his eyes, paid them the ultimate compliment: “The Germans may be able to kill them, but by God they can’t beat them.” But the Germans were coming on in such overwhelming numbers that rifles and courage could not hold them any longer. It was then, in a time of deadly crisis, that wonderful tales of heavenly help began to appear. In one action during the long retreat, an understrength British battalion, about to be overrun by masses of German infantry, became aware of a shadowy army fighting beside them, an army of bowmen of the days of Agincourt, five centuries gone. These phantom men-at-arms cried aloud to St. George, and their swift arrows darkened the sky. A great voice was heard to thunder over the din of battle, “Array, Array!” German prisoners taken in the action said they were bewildered that their British opponents had reverted to wearing armor and shooting arrows. In the night of the 26th, the third day of the retreat west through Belgium, weary British soldiers saw tall, unearthly figures materialize in the gloom above the German lines. They were winged like angels, and as they hovered in the gathering darkness, the Germans inexplicably halted and the British slipped away to safety. During the retreat, some soldiers swore that they had seen the face of the patron saint of England. A wounded Lancashire Fusilier asked a nurse for a picture or medal of Saint George because, he said, he had seen the saint leading the British troops at Vitry-le-Francois. A wounded gunner confirmed his story. He described the saint the same way the fusilier had—a tall, yellow-haired man on a white horse, wearing golden armor and wielding a sword. Other soldiers agreed that he looked just like his image on the gold sovereigns of the day. A story appeared in the North American Review in August 1915 about a soldier who had memorized the motto inscribed on the plates in a London restaurant. Adsit Anglis Sanctus Georgius it read, “May St. George be a present help to England.” Later, in Belgium, the soldier prayed for the saint’s help against the waves of German attackers and was rewarded by a host of shining bowmen, who charged the Germans with shouts of “Harrow! Harrow! Monseigneur St. George, Knight of Heaven, Sweet Saint, succor us!” The arrows of the phantom archers cut down the enemy en masse, and the German General Staff, finding the bodies of hundreds of their men lying on the battlefield with no discernible wounds, came to the conclusion that the British had used poisonous gas. Three soldiers were interviewed separately by the vicar of a church near Keswick, in the north of England. All agreed that a miracle had saved them from a massive German force about to overrun their unit. As the hard-pressed British troops prepared to fight to the end, the Germans suddenly recoiled. German prisoners explained that the attack was aborted because they saw strong British reinforcements coming up. In fact, the ground behind the British unit was empty. The men interviewed had no doubt who authored their salvation: “It was God did it,” they said. The soldier also told his story to another woman, a Red Cross hospital superintendent who interviewed the man and believed him implicitly. So did Harold Begbie, a writer on the supernatural, who related this tale in his 1916 book, On the Side of the Angels. Begbie was impressed with the soldier’s transparent honesty. Begbie also interviewed another soldier who spoke of a “bright light in the sky.” Still another told Begbie that he had heard men in France talking about the celestial apparitions. “He was,” Begbie wrote, “definitely conscious of a supernatural presence.” The soldier in question was a Grenadier Guards NCO, hardly a type given to hysteria and delusion. Another tale was told of a Coldstream Guards unit lost in the gloom of early morning. One man saw a glow in the darkness, a glow that became the figure of a female angel, dressed in white, with a gold band around her hair. Gesturing to the tired guardsmen, she led them through the night to a sunken road, a way out of danger that Coldstream patrols had not been able to find—and afterwards could not find again on any map. Accounts of heavenly aid abounded in Britain. 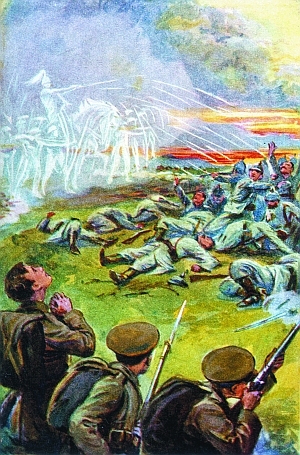 The magazine Light ran a story entitled “The Invisible Allies” in October 1914, and followed up another column the next April reporting that during the retreat from Mons several officers and men had seen a cloud appear between them and the Germans. The Catholic paper The Universe reported an account from a Catholic officer in which an isolated British party decided to charge the enemy head-on. Running into the open, somebody yelled, “St. George for England in the good old style,” and all around the British appeared a spectral company of archers. The British carried the German trench, and a German prisoner later asked the officer who the “officer on a great white horse” had been, for the German riflemen had not been able to hit him. Saved by an Angelic Army or Mass Hysteria? 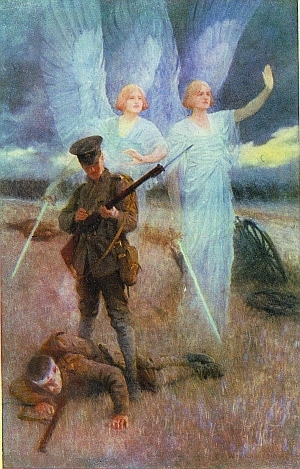 The parish magazine of All Saints, Clifton, reported that two officers had seen a troop of angels between their men and the enemy. The same magazine told the story of another soldier who had seen the same troop of angels standing between him and onrushing German cavalry. The Germans’ horses had panicked and run uncontrollably, allowing the British soldiers to reach safety. A soldier of the Cheshire Regiment saw the angels too, and watched the German cavalry horses panic and bolt before their terrifying presence. A Weymouth clergyman read a letter from a soldier who had slogged through the Mons retreat. The man said he and his comrades had been trapped in a quarry by German cavalry, when suddenly angels lined the edge of the quarry and the Germans broke into panicked flight. Those who scoffed at tales of St. George, angels, and phantom bowmen were quick to point out that it was difficult to obtain firsthand, authenticated evidence, which was certainly true. So what inspired the stories of angels, spectral archers, the mighty figure of St. George? Was it hysteria, fatigue, fear, wishful thinking? Perhaps. But it is worth remembering that the men who told these stories, however exhausted, were tough, experienced soldiers used to such hardships. And a great many of them saw identical sights at different times and in different places. Maybe some of the stories were invented. Maybe all those who said they saw a miracle were simply hallucinating, as the scoffers said. Maybe it was, after all, merely mass hysteria. Tags Angels of Mons, Belgium, Edward II, England, Malplaquet, Regular Army, St George, World War I.